GENEVA, Switzerland -- The lowering of social standards and narrowing of access to social services, arising from the armed conflict and macro-economic reforms, has significantly reduced the quality of life and safety of women in Ukraine. This statement will focus on the impact of macro-economic reforms, an area overlooked by the Human Rights Council (HRC) in its deliberations. 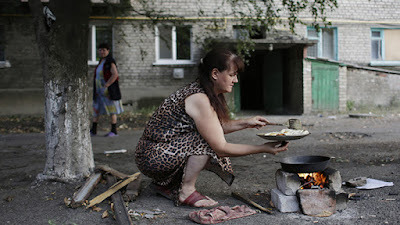 Austerity measures included as part of the conditionalities attached to lending provided by International Financial Institutions (IFIs), mainly the International Monetary Fund (IMF) have disproportionately affected women in Ukraine. WILPF has highlighted these negative impacts in submissions to the CEDAW Committee and to the Universal Periodic Review (UPR). Violations of women’s economic and social rights resulting from implementation of austerity measures has contributed to the feminization of poverty and the deepening of gender inequalities within the family and in the society as a whole. These violations pose significant obstacles to women’s meaningful participation in Ukraine’s peace efforts. While promoting and protecting women’s economic and social rights are crucial ends in themselves, women also need to have the economic resources to be active participants in decision-making processes. Women will not be able to participate in the peace process and post-conflict reconstruction efforts if they struggle to meet the most basic needs for themselves and their families. The reduced access to social and economic services, arising from the cost of the armed conflict and strict macro-economic reforms designed through the lending agreement with the IMF run against Ukraine’s obligations to respect, protect, and fulfill economic and social rights, without retrogression and using maximum available resources. The reduction in public spending has disproportionately affected women in two ways. First, cutbacks in public health and social service expenditures rely on shifting and increasing the burden of care to women. Gendered social norms mean women are expected to compensate for reduced state support by spending more time on unpaid care-work in the family. This, in turn, also reduces the amount of time available for participating in the formal economy. Second, education, health care and social work, public administration, sectors with most job cuts in the economic reform program, are among the most female-dominated economic sectors. Some of the conditions attached to the provision of IMF funding with significant implications on women are: the de facto elimination of fuel subsidies, which has caused higher prices for gas, heating, electricity and transportation; sweeping spending cuts on areas such as health, education and social services; and a major reform of the pension system. Impact of the Elimination of Subsidies for Fuel and Heating Conditionalities, linked to the IMF loan, have required the State to reduce fuel subsidies in order to reduce the deficit of Naftogaz (the state-owned enterprise). Ukraine has failed to provide affordable solutions to its energy crisis and implement its social protection program in connection to the reform. The consequences of the negotiated IMF conditionalities on reducing fuel subsides fuel has led to higher prices for gas, heating, electricity, transportation and other goods and services related to fuel use. The corresponding increase in tariffs has had an extremely negative impact on the living standards of much of the population. In fact, in a country in which prior to the conflict some 60-80% of households received subsidies to pay for utility bills, energy consumption has decreased by 30% compared to 2011. This reduction is not due to energy efficiency, but results directly from the elimination of fuel subsidies. The Ukrainian population as a whole has experienced severe impoverishment, leading to a reduction in all consumption that is not related to immediate survival. In rural areas, the negative impact of the elimination of fuel subsidies has been compounded by the increase in the coal price due to Ukraine’s decision to apply the Rotterdam Plus formula to set the wholesale market price for coal. Residents in rural areas rely more on gas boilers, coal and firewood than on central heating. 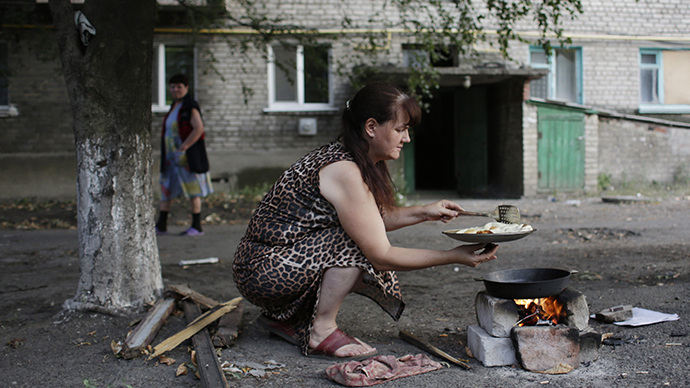 Women are disproportionally impacted as they tend to experience more than both urban women and rural men unemployment and harsh living conditions including because, as a general rule in Ukraine, women earn less than men. The policy of cutting jobs in the health, education and social services sectors primarily affects women who pre-conflict constituted up to 80% of the total number of employees. Cutting, capping or freezing wages or recruitment in the public sector is one of the most clear-cut ways in which macro-economic policy can undermine gender equality, as such policies disproportionately affect women. While the wages in these sectors are the lowest, women employees have previously benefited from a stable income and guarantees of social protection of workers, including pensions, paid holiday, and maternity leave. As well as reducing social spending, Ukraine has also reduced the taxation for big businesses, whilst simultaneously increasing the tax burden on end-users, employees, and medium and small businesses. The vast majority of people affected by these changes are women, including because there are more women among small entrepreneurs as compared with men (53% in 2011, according to the World Bank) and, due to a number of constraints, female-headed enterprises are less profitable regardless of the sector of economic activity. In accordance with IMF requirements, during 2014-2015, 165,000 civil service jobs were cut, with overall plans of a 20% reduction in the civil service workforce. This reduction has been undertaken through, inter alia, the reorganization of ten and closing of eight government agencies. There are plans for further downsizing of the public sector with the goal of lowering the overall spending on salary for civil servants to around 9% of GDP in the medium term. Women comprise more than 75% of the civil service, predominately in non-managerial positions, and, therefore, have been disproportionately impacted – and will continue to be – by these cuts. Again, no effective social protection programs have been developed or implemented to compensate or ensure sustainable job creation for women. In 2014, 12,000 social workers lost their jobs; many of them were women. These cuts had extremely negative consequences for both the beneficiaries of social services and the women whose jobs were cut, since the vast majority of workers in schools, hospitals and clinics are women. A year later, a further 25,000 healthcare professionals lost their jobs. In the last three years, decentralization has led to a significant transfer of responsibilities for the financing of education, science and healthcare to local budgets, most of which have very limited financial resources. This has led to a reduction in the number of hospital beds and hospital staff, and in many cases, local government authorities have had to close schools, hospitals and clinics due to the lack of resources. One of the most well-known examples is the closing of the hospital and several schools in the town of Romny, which caused a wave of protests and outrage across the country. Since 2013, there has been a sharp decline in state spending on education services. This has impacted both the beneficiaries of these services and the employees in this sector, who tend to be mostly women, who are finding it necessary to look for additional part-time jobs to supplement their income. The government plans to reduce workers in the education sector to fulfill the IMF requirement of ‘optimization’ of the network of schools and educational institutions. Spending cuts in the educational sector has led to the closing of several educational facilities. In 2012, there were 20,090 educational institutions in Ukraine. This number has steadily decreased. In particular, between 2014 and 2016, 38 schools were closed in urban areas and 231 in rural areas. This trend is expected to continue; there are now 2,500 schools that are candidates for closure due to their small numbers of pupils (10-100 pupils). The monthly payments of assistance for childcare until the age of three were de facto abolished in July 2014, as part of the IMF required reforms in the areas of social services. These payments were one of the most effective types of social assistance to families with children. In the case of low-income families and single parents, they helped low-income families and single parents to survive during their time away from the labour market. Recommendations IMF and other IFIs do not apply a human-rights-based approach as part of their macroeconomic framework and therefore neglect the consequences of human rights obligations in the negotiations. WILPF urges States to ensure that HRC address the negative effect of macro-economic reforms on human rights in Ukraine, and in particular on the often disproportionate impact on women. In this regard, the HRC should call on Ukraine to: conduct cumulative and participatory human rights, gender and environmental impact and budget assessments before accepting conditionalities linked to funding from IMF or other IFIs; ensure that these outcomes these assessments are part of the negotiations with IFIs, and that social protection programs are included in the outcome documents and budget allocations; adopt a rights-based approach to macroeconomic policy-making and spending decisions that affect vulnerable groups, including cumulative and participatory budget and impact assessments; identify and implement policies that can limit the negative impact of austerity measures or provide and effective alternative; ensure that women and civil society are included in the consultations and decision-making around IFI loans, and increase transparency in any negotiation and approval process.